Meek Mill has hit out at top defence attorney Christopher Darden for agreeing to take on rapper Nipsey Hussle’s murder suspect as a client. Rapper Meek Mill has called for sweeping changes to the criminal justice system in an essay published in the New York Times on Monday. Rapper Meek Mill has filed an appeal after he was denied a new trial for a 10-year-old case earlier this week. Rapper Meek Mill surprised fans at the Rolling Loud Festival in Florida on Saturday when he returned to the stage for the first time since his prison release. Rapper Meek Mill is reportedly back to work following his release from prison. Rapper Meek Mill will remain behind bars after his bail was denied again on Monday. 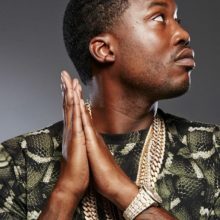 Incarcerated rapper Meek Mill has had his latest bid for bail shot down after he was deemed a “danger to the community”. Meek Mill is to apply for a pardon after his jailing for violating the conditions of his probation. Meek Mill is ‘no longer welcome in Toronto, according to City Councillor Norm Kelly. A Hollywood billionaire has offered a $10,000,000 purse to Chris Brown and Drake to get in the ring and punch each other’s lights out.